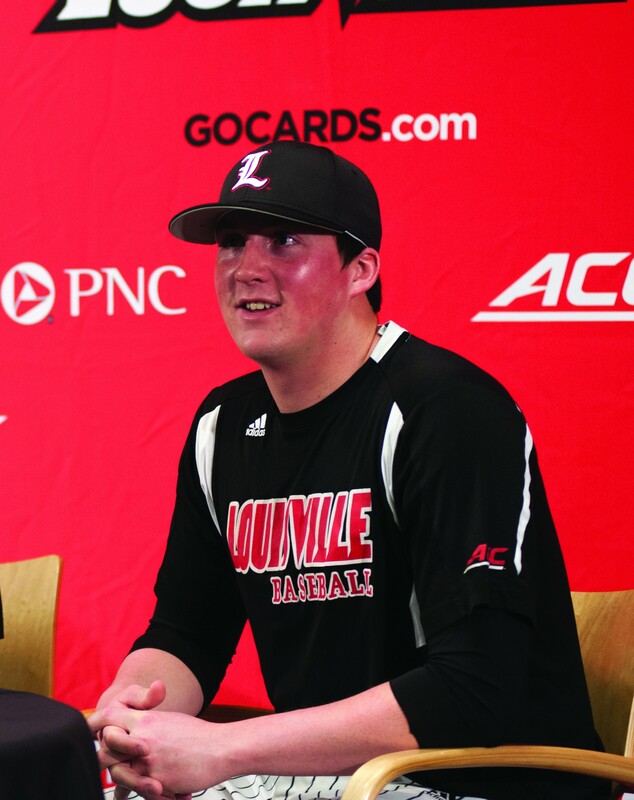 The 2015 Cardinal baseball pitching staff is one loaded with talent and experience, but among them, junior Kyle Funkhouser, has emerged as the star. Last year, Funkhouser set the University of Louisville school record for wins with 13. He also finished third all time at U of L with 122 strikeouts and had a 1.94 earned run average. At the end of the season, he earned First Team American Baseball Coaches Association, Second Team Louisville Slugger All American, Second Team National Collegiate Baseball Writers Association All American, Third Team Perfect Game All American and Third Team Baseball America All American honors. He was also named to the All American Conference First Team and the Louisville Regional All Tournament Team. Coming into this year, the accolades haven’t stopped coming in for the six-foot-three righty. He has earned First Team Preseason All American honors from Baseball America, College Baseball Newspaper, Perfect Game and the NCBWA, in addition to Second Team Preseason All American honors from D1baseball.com. As a freshman, Funkhouser only started in six of the 22 games he appeared in, earning a 5-1 record and being named a Louisville Slugger Freshman All-American. He started in all 18 of his games played in as a sophomore, but wasn’t the Friday starter until late in the season. This year, Funkhouser is the Friday starter from the get-go and will be looked at as the workhorse on a loaded pitching staff. “He’s clearly the cowbell now,” coach Dan McDonnell said of the junior ace. “When we give it to you on Friday, it’s to set the tone and you must attack the strike zone and try to keep your pitch count down as much as you can. You don’t want to deplete your bullpen. If you got to go to all your top relievers on Friday, you’re behind on Saturday and Sunday. So I think where Kyle can improve, given the opportunity from the first start on is to set the tone. Setting the tone doesn’t look like it’ll be a problem for Funkhouser. In his first start in the season opener against Alabama State, he tied his career high in strikeouts with 12 and allowed one hit while throwing seven shutout innings, en route to a 5-1 victory for the Cardinals.